You may use SpeedTest.net to test the upload/download speed between you (your broadband) and our web hosting network. With the revolution of computing and technology and online websites, our business is evolving. The team of Website Solution is an extended organization designed to meet the needs of web hosting and other variables. In today’s world full of websites and online, we must keep up with changing trends. Constant updates and effective presentation are significant. As a business that runs online web page, it is crucial to maintaining the outlook of the entire website. Website Solutions strives to rectify all your worrisome problems and enhance your overall web presence. With a wealth of experience and tools, Website Solution serves our clients and customers with the necessary changing needs. Our undeterred determination adequately reflects the credibility of our esteemed services. In our effort to exponentially increase the visibility, standard, and service of the online business website, we leave no stone unturned. At Website Solution, data transfer, information update, and web prominence are the key components of our services. Our pride is to accelerating hosting speed we offered. Within a matter of seconds or minutes, we deliver expert services and web page efficiency. There is nothing more annoying than a high-end business facing a slow pacing web page that takes ages to load. To resolve that disturbing concern we have taken necessary steps to increase the hosting speed. Your every demand would execute to perfection. The hosting speed test on our website is proficient and reliable in results and conclusions. You can check the speed between our web hosting and your broadband. The link – http://www.speedtest.net – takes you straight to a self-initiating speed test to verify the speed with accuracy. 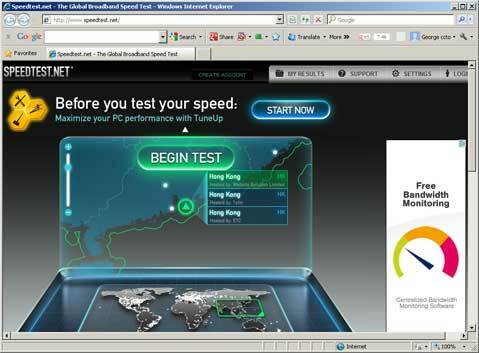 Website Solution Limited is one of the official test sites of speedtest.net in Hong Kong. We can provide reliable, high performance, and dedicated connectivity to local and international.